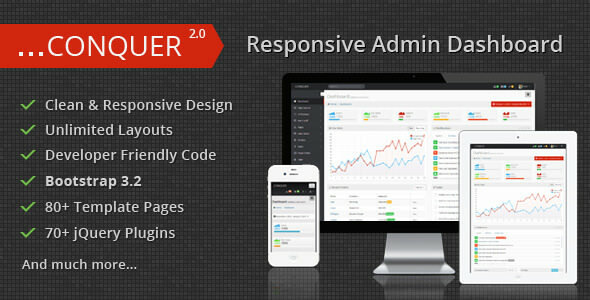 Conquer is a responsive admin dashboard template created mainly for admin and backend applications(CMS, CRM, Custom Admin Application, Admin Dashboard). Conquer template powered with Twitter Bootstrap 3.2 Framework and it comes with a huge collection of reusable UI components and integrated jQuery plugins. Conquer template works on all major web browsers, tablets and phones.